The name has changed, but the goal and the outcome are the same! What was once the David Oliver Invitational became the RH Fit Pro Elite Invitational in 2018, and in 2019 it will be called the Mondo Elite Invitational. Whatever the name, though, the meet exists to draw some of the top talent in the Southeast together for an extremely competitive late winter/early spring meet. Stars from North Carolina and Tennessee will be gearing up for their indoor state meet, while the best from Georgia, Florida, and South Carolina are preparing for the start of the outdoor season - and all of them want a big race to set the tone! This year is shaping up to be one of the best in the meet's 6-year history, as nationally-ranked athletes from 5 states have already committed to participate. 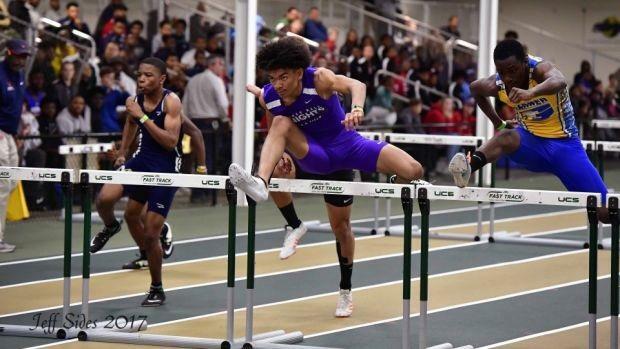 The early leader for best event is the Boys Elite 60 Hurdles, which features four sub-14 returning hurdlers that are all ranked in the top 12 in the country heading into the upcoming outdoor season. North Carolina's Joshua Brockman (Ardrey Kell) and Georgia's Myles Marshall (Lassiter) are US #5 and US #6, respectively, and they will be challenged by US #7 Braydon Bennett of South Carolina. Brevin Sims (Chattanooga School for the Arts & Sciences TN) is the wild card in this race: he had a wind-aided 13.89 last spring that would rank US #12 all-conditions (and won him a state championship), but he doesn't have a sub-14 that was wind-legal. Still, with those four already in the race and four spots still open, this is shaping up to be the can't-miss event of the Mondo Elite Invitational! The Girls Elite 400 also has the potential to be eye-opening. It starts with the nation's newest superstar freshman, Kayla Davis (Run U Xpress), who is currently US #1 in the 300 and 500 this winter. Davis ran 53.01 last spring, which makes her the #6 returner in the nation, and she ran 52.54 as seventh-grader to win the 2017 USATF Junior Olympic 400 title. She will square off against US #21 Kyna Robinson (Southeast Raleigh NC) and Zariere Dumas (Hillcrest SC), and we hope to confirm two more US top 10 returners soon. The Boys Elite Mile should be both fast and highly competitive, with US #13 Hugh Brittenham (Estero FL) leading the way and Kyle Harkabus (East Coweta GA) returning for another run at the title. Kyle Durham (Weddington) leads the returning NC contingent, joined by Nickolas Scudder (Millbrook), currently US #18 this indoor season. Coen Roberts (Greer) will represent South Carolina, and we still hope to hear from national-caliber runners from three states that may join the field. On the girls' side, freshman Foot Locker finalist Jenna Hutchins (Science Hill TN) hopes to continue her string of successful races on NC soil, with current NC #2 Cora Cooke (Myers Park) and the #3 returner in South Carolina, Isabel Muehleman (Hilton Head) there to contend as well. The Boys Elite 60 Dash is also shaping up to be strong, with an established star going head to head with some rising talent eager to prove. Ebony Jackson (Kell), Georgia state champion and the #1 returner in his state (US #18) will take on two of North Carolina's top contenders in Cameron Rose (Hickory Ridge NC) and Royal Burris (Harding University NC), among others. Sierra Fletcher (Southeast Raleigh NC) headlines the Girls Elite 60 Hurdles as the #16 returner in the nation in the 100 Hurdles and #7 in the 55 Hurdles. The Boys Elite 400 will feature a match-up of top North Carolina returners, with Khaleb McRae (Southern Durham NC) and Emerson Douds (Weddington NC) both looking to improve on their mid-47 times from last spring. There are still open spots in all eight Elite races (60 Dash, 60 Hurdles, 400, and Mile). Do YOU think you have what it takes to compete at this level? Email Jeff George at ncmilesplit@gmail.com if you're interested!